Samsung Electronics is proud to launch a series of innovative and pioneering products at this year’s IFA in Berlin. 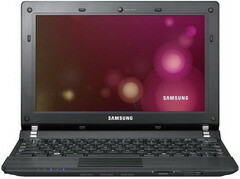 At IFA 2010, Samsung is putting its achievements in mobile computing on full display. The company is showcasing the world’s first LTE-HSPA+ dual mode netbook, the Samsung N350. Samsung N350 features Windows 7 Starter Edition OS, 1.66 GHz Intel Atom N550 dual core processor, a 10.1-inch (1024x600) matte screen, 250 GB of hard drive space, 1 GB RAM, , 3x USB ports, 1.3MP webcam, 802.11n WiFi, and Bluetooth 3.0. The new ultra-thin N350 is a light and compact netbook with embedded LTE-HSPA+ dual mode technology. This new technology gives users the best in wireless technologies allowing them to experience internet speeds that are comparable with fixed internet services. The N350 harnesses the power of two technologies and allows users to make the most of both 3G and 4G networks. Using dual mode technology, users will be able to stay connected in areas without LTE services using a standard and widely available 3G network. 0 comments on "Samsung N350 is the world’s first LTE-HSPA+ dual mode netbook"